Mt. Evans is one of my favorite destinations in the summer when I'm looking for an easy trip to photograph wildlife. On any given day it''s common to see mountain goats, bighorn sheep, elk, deer, marmots, pikas, foxes, coyotes, ermine and many other animals that make their home on the high alpine tundra. The road to the top of Mount Evans is the highest paved road in all of North America, passing three different life zones on the way. The road gives many a chance to see what it looks like from the top of one of Colorado's highest peaks, who wouldn't otherwise get to. Prepare for any type of weather on this road in the summer, including snow. I don't find the road to be dangerous at all, but I have taken a few people up who were very disoriented by the altitude and drop offs on the side of the road. I typically do this drive at sunrise, when the light is best for photography. This time of the day you usually have the mountain to yourself, but during the day it gets more crowded and you will most likely find yourself behind someone who is going way too slow for your taste. I timed this drive out so that I would make it to the top just as the full moon was setting to the west at the same time as the sun was rising to the east. Once you make it to the top of the road its a short 100-something foot hike to the official summit. As a side note... Access to Mt. Evans is currently under the jurisdiction of three different governmental units. CDOT, Denver Mountain Parks and the US Forest Service. There is a 10 dollar fee to use the road, but what they don't tell you, is that if you just plan to drive up and down the mountain there is no fee. Paying at all to use public land is a controversial issue on Mt. Evans, and as far as I'm concerned, up for interpretation when it comes to paying the fee. 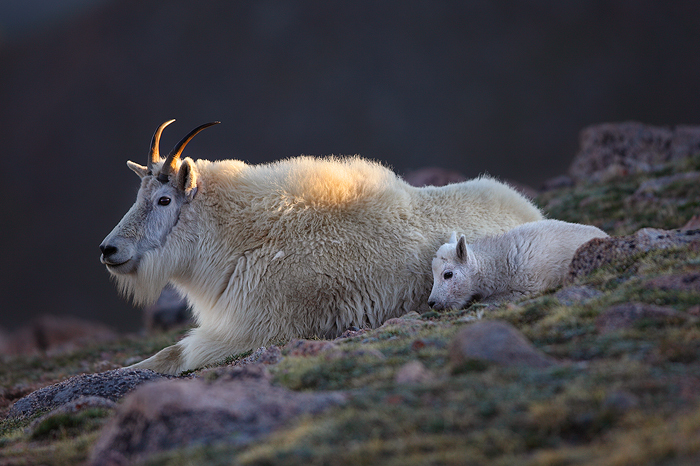 A nanny mountain goat and her kid bed down for the evening as the last rays of the day slip behind a large mountain.